"It's all right, I am a doctor." It's difficult to find a scarier, more imposing super-hero than The Incredible Hulk. The same terrifying vibe existed in the old TV show that first brought the big green guy to live-action life. Growing up watching the show, I remember feeling an overwhelming sense of fear when the title character was on-screen, but I kept coming back to every week. Staying true to the Marvel Comics publication (created by Stan Lee and Jack Kirby), The Incredible Hulk series began as a 1977 TV movie. In this film (available separately, but thankfully included in this set), we meet Bruce Banner (Bill Bixby), a scientist who has just lost his girlfriend in a car accident. Naturally distraught, Banner decides to study human stress with his colleague, Dr. Elaina Marks (Susan Sullivan). Once they center on gamma rays, Banner takes his experiments a bit too far and is exposed to massive amounts of radiation. The main post-radiation side effect is his body's transformation into a giant green creature, dubbed The Hulk (Lou Ferrigno). Now on the run from just about everyone, Banner/Hulk have the added problem of avoiding tabloid reporter Jack McGee (Jack Colvin). Having flirted with various separate DVD releases of The Incredible Hulk, Universal has finally given us our first full season. The first of four discs includes the aforementioned Pilot, as well as a second feature-length TV movie, Death in the Family (The Return of The Incredible Hulk). The former establishes the series' main storyline, and the latter picks things up with everyone believing Banner to be dead. He winds up on a ranch in California with a disabled girl named Julie (Laurie Prange), who is being poisoned by Dr. Bonifont (William Daniels) so her stepmother can steal her inheritance. Once things go too far, The Hulk makes an appearance and sets the bad guys straight. Disc 2 gives us the first four hour-long episodes, beginning with The Final Round. After the problems in California, Bruce heads east and meets Rocky (Martin Kove), an amateur boxer who is smuggling heroin for the local gym's owner (Al Ruscio). In The Beast Within, Banner finds a job at a zoo where the lovely Dr. Claudia Baxter (Caroline McWilliams) is employed. She is researching genetics, and Bruce sees this as his opportunity to rid himself of The Hulk forever. Of Guilt, Models and Murder has Bruce waking up from a Hulk incident in a room with the murdered bodies of fashion models. Bruce instantly blames The Hulk for these deaths, but he soon learns that there's more going on than he thought. Disc 2 ends with Terror in Times Square, where he meets another lovely lady, Carol (Pamela Susan Shoop), and is unwillingly involved with her father's (Jack Kruschen) mob dealings. The third DVD keeps things going with one of the more exciting installments, 747. As the title suggests, it takes place on a plane. 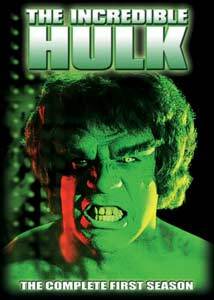 When Bruce determines the pilot (Del Hinkley) is trying to kill the passengers, the Hulk takes over to save the day. The Hulk Breaks Las Vegas is my personal favorite Season One episode, and, while very cheesy at times, it's always nice to see location footage of a great city that has changed drastically over the decades. Probably the least engaging of the set, Never Give a Trucker an Even Break takes Banner to his next job, helping a trucker named Joanie (Jennifer Darling). Unfortunately, she's a very week love interest for Bruce, and the overall storyline is simply uninteresting. Life and Death revolves mostly around Bruce's interactions at a hospital, including the Hulk's attempts to stop some baby stealers. Disc 4 has a pair of episodes to finish up the first season: Earthquakes Happen (Nuclear Cave In) and The Waterfront Story. In the first, we get deep into the Banner versus Hulk storyline when Bruce has found some gamma ray equipment. With all intentions of using the devices on himself to destroy the Hulk, Bruce's plans are averted when a large earthquake hits. The season finale, The Waterfront Story, takes us to Galveston, Texas, where Bruce meets Josie (Sheila Larken), who is looking to stop the man who murdered her husband. The season ends with a bang, as Bruce "Hulks-out" to help Josie find justice. This classic show's most impressive dynamic comes from the decision to have two separate actors play the Banner/Hulk alter-egos. Long before the days of CGI, the writers and producers had no choice but to find a pair of actors that embodied these separate, yet close entities. Both Bixby and Ferrigno were the right men for the job, as the former provided the right mix of brains and everyman charm, and the latter was the perfect mindless brute. As future seasons will show, The Incredible Hulk would mature into one of the more solid genre efforts TV ever. Image Transfer Review: All 12 episodes are presented in their original full frame format. While still quite grainy and not without blemishes, there appears to have been a good clean-up effort on the source material. Images are very detailed and sharp, while contrast and shadow levels remain consistent. The color scheme is muted, which isn't a huge surprise, but the hues and fleshtones are true and realistic. Audio Transfer Review: The Dolby Digital 2.0 audio stays exclusively up front, but is always solid, allowing dialogue to remain crisp and clear at all times and seamlessly integrating music and sound effects. This is far from reference material, but won't disappoint fans of the show. Stop the Presses - Bonus episode from season two. Extras Review: There's only a pair of extras (not including the sneak peeks for other Universal releases), but both are well worth checking out. The first is an audio commentary on the Pilot episode with producer, writer, and director Kenneth Johnson. He played a huge part in the creation of The Incredible Hulk, so Johnson has a ton of information to give us about this first TV movie, and the hour-long series as well. The most interesting talk involves the casting of Bill Bixby and Lou Ferrigno, especially his musings on working with the latter's massive body-building frame. The other extra is a bonus episode from the second season of The Incredible Hulk, Stop the Presses. While we'll get to enjoy this fun installment all over again in the second DVD collection, it's still nice to get a preview of what to expect from that set. Forget Ang Lee's misguided stab at this beloved franchise and relive the TV days of everyone's favorite big green monster with Universal Home Video's The Incredible Hulk: The Complete First Season. The early adventures of Bruce Banner and his alter-ego are captured quite nicely in this 12-episode, four-disc DVD set, which features impressive video, adequate audio, and even a couple of extra features.